Google developed a Chrome extension for Google Scribe, the text completion service launched earlier this week. By default, Google Scribe is disabled, but you can enable it by pressing Ctrl+J. You can also press Ctrl+Shift+J to switch to the on-demand mode that shows suggestions only when you press Tab. If you find Google Scribe useful or you use the on-demand mode, there’s an option to automatically activate the service for any text field. 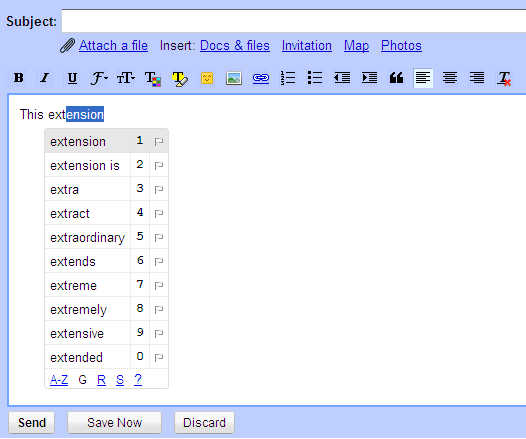 The extension doesn’t work well in Gmail if you use the editor’s plain text mode or Scribe’s on-demand mode. Another Google service that’s not compatible with Scribe is Google Docs, which uses a custom text editor. For other browsers, you can add the bookmarklet from this page. The main difference is that you have to enable Scribe by clicking on the bookmarklet. On an unrelated note, the screenshot above shows some new Gmail features that are tested internally at Google: inserting Google Docs files, photos and maps.